Purchase 2 Vignette® Modern Roman Shades and receive a $100 Rebate PLUS $50 Rebate for each additional unit. If you need more than one window covering, it’s a great time to buy. Vignette® Modern Roman Shades have a vertical or horizontal orientation so you can create the look you want on your windows. Available with motorization. 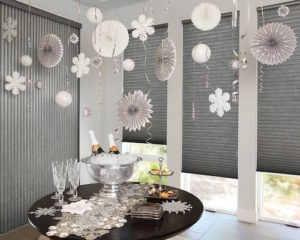 Buy 4 Duette® Honeycomb Shades and receive a $100 rebate PLUS $25 Rebate for each additional unit. 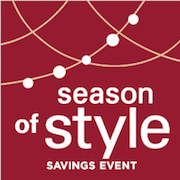 Save when you buy more than one window shade or blind during the Energy Smart Style Savings Event. Duette® Honeycomb Shades offer complete privacy or amazing views wherever you want on the window with top-down, bottom up features. Available with PowerView® Motorization. Buy 4 Sonnette™ Cellular Roller Shades and receive and $100 Rebate PLUS $25 Rebate for each additional unit. Sonnette™ Cellular Shades is new to the “ette” collection of Hunter Douglas window fashions. It joins the family of Silhouette®, Luminette®, Pirouette®, Duette® and Vignette® with its beautiful curved fabrics and ability to control the light. Available with Hunter Douglas PowerView® Motorization. All of these Hunter Douglas window shades are energy-efficient. You can reduce your energy bills in Middletown and Orange County, New York by purchasing energy-efficient window shades for your home or office. Did you know you can lose up to 50% off your homes heating through your windows? 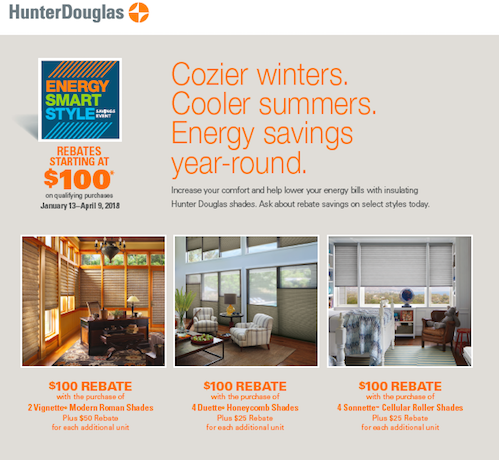 Hunter Douglas energy-efficient blinds help keep your home warm in winter and cool in summer so you can save on energy bills all year long. The fabrics of Hunter Douglas roman shades, honeycomb shades and cellular shades are constructed to trap warm air inside your home or office during winter. Since the temperatures have been extremely cold in Middletown and Orange County, you’ll want to pay attention to drafts inside your home. Warm air can easily escape through your windows causing an increase in your energy bills. Vignette® Modern Roman Shades are made with soft but durable fabrics. 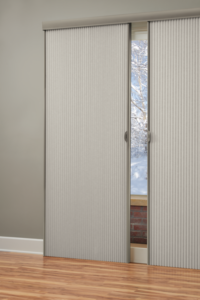 Vignette® Modern Roman Shades fabric provide extra layers of protection against the winter cold and summer heat. The roman shade fabric is available with 4” or 6” flat folds that roll up into the headrail for a streamlined look on your windows. Vignette® Modern Roman Shades reduce outside noise for increased energy efficiency. 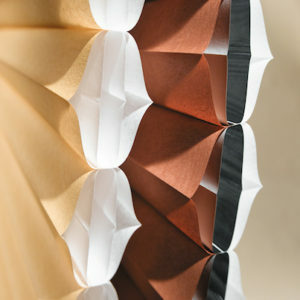 Duette® Honeycomb Shades have an amazing cellular look reminiscent of wax cells built by bees. The cellular shade fabric is available in single, double, and triple layer construction so you can decide the level of energy-efficiency based on your budget. 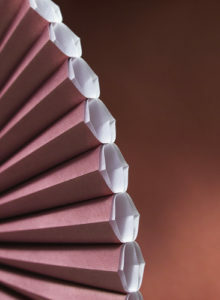 Duette® Honeycomb Shade fabrics are available in bold colors and exquisite textures. You can cover large expansive windows like sliding glass doors with Vertiglide®. 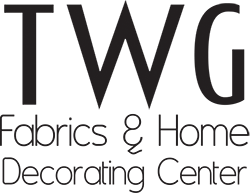 Vertiglide® offers increased insulation on large vertical windows and doors. Duette® Vertiglide can even be used as room dividers. Sonnette™ Cellular Roller Shades have the construction of a cellular shade but the clean lines of a roller shade. 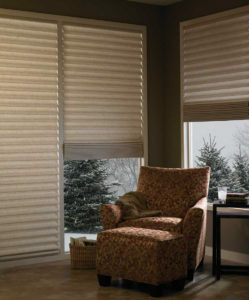 Sonnette™ Cellular Roller Shades are available cordless. Cordless blinds and Hunter Douglas PowerView® motorization are great options for child and pet safety. 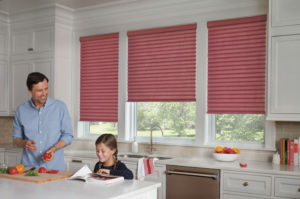 If you have children or pets, motorized blinds is the solution to keeping your loved ones safe. Most Hunter Douglas window shades and window blinds are available without exposed or dangling cords. If you have a specialty-shaped window, TWG Fabrics & Home Decorating Center can offer expert window treatment advice. TWG provides window coverings for hexagon windows, octagon windows, arches & angles, skylights, trapezoid and more. Contact TWG Fabrics & Home Decorating Center to guide you through all the Hunter Douglas window treatment options. No matter what your window covering challenge, TWG Fabrics & Home Decorating Center is here and ready to help. Contact TWG for a free window shades and window blinds consultation.